ronan (Homepage) wrote: excellent capture, the lights are beautiful. Tim Corbeel (Homepage) wrote: Superb exposure and composition! Very nice work! Miles Wolstenholme (Homepage) wrote: Great shot, the exposure works well. cako (Homepage) wrote: Interesting long time exposure. Great motion effect. siam (Homepage) wrote: Image très jolie, hauteur de gamme des couleurs. Chris Chisu (Homepage) wrote: Beautiful composition. dewaun.simmons (Homepage) wrote: rather exhilarating photo! I like the whirling feeling of the ferris wheel and the angled-in feeling of the buildings. Nice stuff! Laurie (Homepage) wrote: Oh my! It looks like it is falling! grant (Homepage) wrote: very cool. these things scare the hell out of me though! 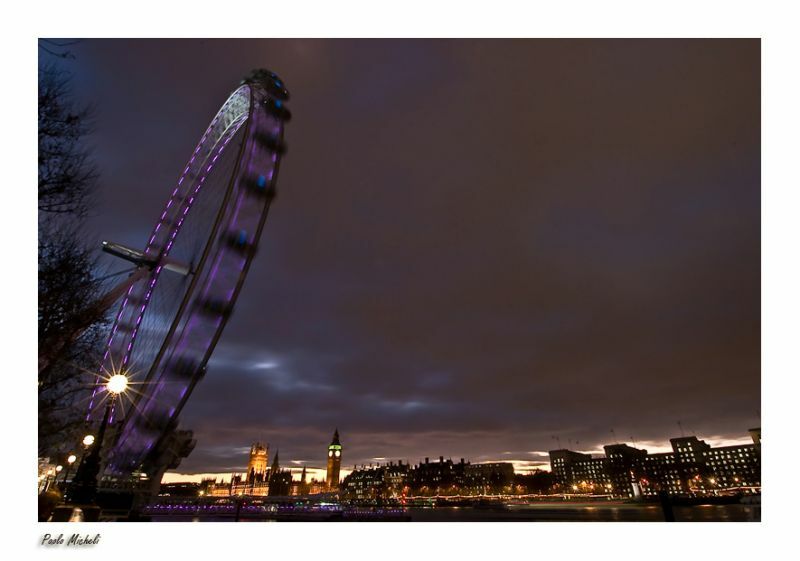 Ilger.nl (Homepage) wrote: London eye goes mad! How does this work? tom (Homepage) wrote: Fantastic image. Great work! Markus Spring (Homepage) wrote: You made best use of the wideangle characteristics and got great dynamics here! oldshutterhand (Homepage) wrote: I bet it´s fun to ride. Great night shot. Frida (Homepage) wrote: Interesting picture. I really like the color and tones. The movement in the Eye and the city silhouette in the back. Well captured! Polydactyle (Homepage) wrote: Nice mouvement photo and cool night view! Darrius (Homepage) wrote: really nice framing and balance between the cityscape, night sky, and Ferris wheel. beanow (Homepage) wrote: Magic image...I love it! Mirko Herzner (Homepage) wrote: Again a lovely work. I especially like the composition here. Colors are nice, too. Mario Jean (Homepage) wrote: Interesting and unusual point of view. Very beautiful. Tom (Homepage) wrote: Very cool aspect. Really interesting shot. Michael Skorulski (Homepage) wrote: Wonderful. I think there is great action here.